Notes: "One of two large granite blocks situated some 500 meters east of Hangershell Rocks. May be fallen standing stones or stones brought to the site but never erected. This western stone lies 55 meters from the other and tapers towards its northern end. Between the two are traces of two other stones, and the fact that they form a straight line lends weight to the argument that they are fallen menhirs. This western stone was excavated in august 1968, and groups of small stones were found at the broad end and along the w side as if to receive the stone when it was erected." For more on that see coverage on the SRGB and on PMD. See also HER record MDV2883. Notes: "There are two possible menhirs, on Beacon Plain, 500 yards east of Hangershell Rock. The more easterly stone measures 18 feet 4 inches in length. The other stone lies 57 yards away on a bearing 26 degrees south of west. It is 18 feet in length, 5 feet 6 inches wide at one end, and tapers to a blunt point. 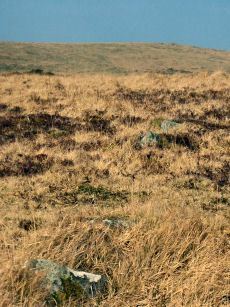 The stones are completely isolated on a grass moor, and have none of the characteristics of surface boulders. 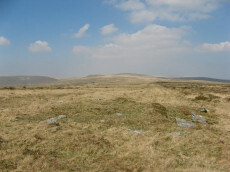 If they were menhirs they are the largest known on Dartmoor." There are suggestions these two stones are ends of a short stone row with a smaller stone in between. For more on that see coverage on the SRGB and on PMD. See also HER record MDV2888. meets the double section of the rows at an angle of about 10o on the north-west side, extending westward to about level with the terminal. Visual projection east-ward along the third row appears to be in line with the orthostat". Lethbridge 78 Rows 4/5 diagram p.77. Formerly listed as Butter Brook 2. Notes: "The mound is situated on a slight south-east slope at 1050 ft O.D. It is 25 metres long, orientated north-south, is 16.0 metres wide and 0.9 metre high at the north end and 10.0 metres wide and 0.7 metre high at the south end. There are no visible side ditches. The construction is of earth and small stones but extensive pillaging and/or excavation has exposed a number of large upright and some displaced stones. The mound is certainly a long barrow." 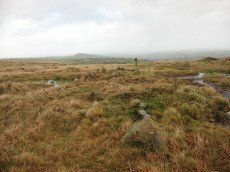 Notes: "The northern part of the Butterdon stone row has been surveyed from Hangershell Rocks cairn at SX 65645941 to Hobajons Cross at SX 65506045." and "For the 1050m of this part the majority of the several hundred stones are from 0.1m to 0.4m high and form an irregular line. There is a gap of 70.0m on the north side of Hangershell but otherwise the row is fairly continuous. The area is not entirely free of natural surface stones and while some can be immediately discounted occasionally there is a short double or triple row where all the stones are alike and these which formed the original row cannot now be determined. Barely two dozen stones are 0.5m high or higher, Hobajons Cross at 1.2m being the highest. 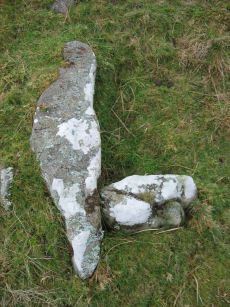 It is possible that this was at some stage a terminal stone since it appears to have cup marks on the south face and the extension onwards, to the Longstone, is on an entirely different alignment." Lethbridge Row 1 diagram p.77. Notes: Turner F8. 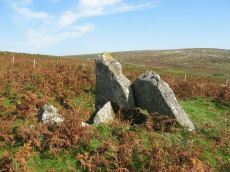 A low cairn within a retaining circle of stones is situated at SX65635881, at the south end of the Butterdon stone row (SX 65 NE 17), with which it is associated. The circle is 11 metres in diameter, and consists of twelve stones, all now recumbent, although when Worth wrote in 1941, one was erect and three were leaning. Some of the stones are unusually large. 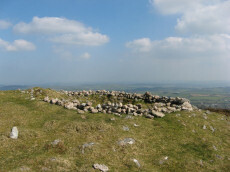 The cairn is 9 metres in diameter by 0.3 metre high, with a hollow in the centre. Radcliffe reports: Mike Brown says the row "terminates in a small kistvaen" at its southern end. Hemery says the cist "has been removed". Lethbridge p.78 Row 1 diagram p.77. Notes: Grinsell UGBOROUGH 1. 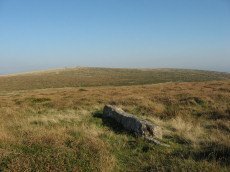 "The remains of a long cairn and burial chamber on a hill-slope at Cuckoo Ball. 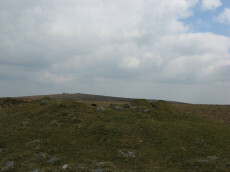 The cairn, which was probably robbed for newtake walls to the west and north, is 23 metres long by 12 metres wide, aligned north/south, and is 0.7 metre high at the north. The burial chamber is at the north end." Notes: Turner Stone Circle G28. Lower end of stone row. "A stone row, 300 yds S 41o W from Glasscombe Corner. The southern 368 feet are a double row and the northern 212 feet 6 inches a single row. The northern part has lost no stones and the change from double to single is abrupt and complete. At the S.W. 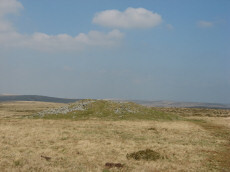 end are the remains of a cairn and at the NE. end is a retaining circle with many of the stones fallen. It would appear thus that there was a grave at either end of the row. " 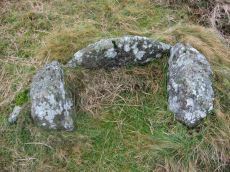 Notes: "A stone row partly double and partly single ending on the remains of a cairn circle. The length of the double row is 111.0m. and of the single row 61.0m, the total length to the centre of the cairn circle being 177.0m". Lethbridge Avon Valley stone row pp.81-82, diagram p.81. Notes: East of hangershell rock large cairn with hollow centre. Diameter 17m, height 1.2m. Notes: Turner F9. 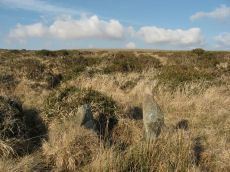 Cairn at SX 65855985, 12 metres in diameter by 0.4 metres high, with two stones of retaining circle, from which double stone row descends to north north west. 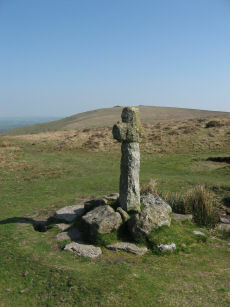 Photo is of Spurrells Cross. Notes: Turner A28. 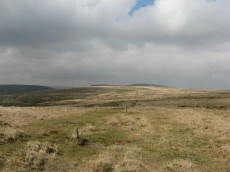 "Weatherdon hill (4): diameter approx.5.6m ht. Approx 0.15m. Alt. C.335-340m." 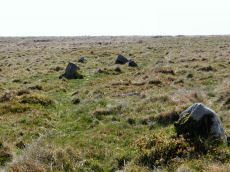 "Mr. L. V. Grinsell noted a small cairn-circle or ring-cairn a short distance south of cairn 2 on weatherdon hill. "